As we approach the end of 2011, we would like to reflect on a special milestone that we celebrated this year, 120 years of Ukrainian Settlement in Canada and share some of the accomplishments achieved by the Ukrainian Canadian Congress (UCC). Thanks to you, we have made some real strides on behalf of the Ukrainian Canadian community. Our recent efforts have focussed on ensuring that the Canadian Museum for Human Rights fairly and equitably represents the Holodomor of 1932-33 as well as Canada’s first national internment operations in Canada’s newest taxpayer funded museum. To start off 2011, UCC launched the 120th Anniversary of Ukrainian Settlement in Canada and launched a new logo to commemorate this historical year. The logo was designed by artist Oleh Lesiuk. April 26, 2011 – UCC, in solidarity with the Japanese community, commemorated the 25th Anniversary of the Chornobyl Nuclear Disaster and Fukushima Nuclear Accidents. June 15, 2011 – UCC launched a National Youth Survey an “Investigation of Youth Involvement in the Ukrainian Canadian Community”. June 20, 2011 – The Canada Ukraine Advisory Committee (CUAC) held its semi-annual meetings to discuss Canada-Ukraine policy priorities. June 24, 2011 – UCC held its Annual General Meeting in Saskatoon, setting the priorities for our community’s agenda over the next 3 years. June 26, 2011 – UCC President Paul Grod delivered greetings during the historic unveiling of the Taras Shevchenko Monument in Canada’s capital region of Ottawa. June 30, 2011 – UCC opened its National Office in Ottawa. The office has been operating for 8 months and has had a large impact on our government relations. The official opening and blessing of the office is scheduled for February, 2012. August 10, 2011 – UCC met with incoming Ambassador of Canada to Ukraine, Mr. Troy Lulashnyk and participated in farewell reception to Ambassador Ostash hosted by Canada’s Foreign Minister, John Baird. August 19, 2011 – UCC launched a joint fundraiser for African Famine Relief. Memories of the millions of lives lost in Ukraine’s genocidal famine in 1932-1933, the Holodomor moved Ukrainian Canadians to launch a campaign which contributed $110,000 to UNICEF Canada for famine relief. This sum was matched by the government of Canada representing $220,000 raised for famine relief. August 19-21, 2011 – UCC participated in World Forum of Ukrainians in Kyiv, Ukraine. August 26, 2011 – UCC attended Yulia Tymonshenko’s trial. Delegates from the Ukrainian Canadian Congress attended the proceedings of the Pecherskyy Raionny Sud in the Yulia Tymoshenko case in Kyiv, Ukraine. August 26, 2011 – UCC together with UWC delegation meets with Ukraine’s President Viktor Yanukovych. October 14, 2011 – UCC met privately with Prime Minister Stephen Harper and awarded the Taras Shevchenko Medal to PM Harper at a Tribute event in Toronto. October 24, 2011 – UCC hosted the first annual Ukrainian Day on the Hill. The Ukrainian Canadian community held its inaugural Ukrainian Day on the Hill with a grand celebration of Ukrainian culture and heritage at the Government Conference Center with over 400 guests present. This event was coupled with two intense days of meetings between Ukrainian community leaders and political leaders, diplomats and government officials. The purpose of these meetings was to inform decision makers about a number of important issues to the Ukrainian Canadian community. November 21 – 27, 2011 – UCC held its annual National Holodomor Awareness Week. Cities throughout Canada successfully held services to commemorate the 78th anniversary of the Holodomor. These successes are just a few from a long list of achievements we accomplished in 2011. We would like to thank you for your continuing support, without which; none of these milestones could have been reached. Your support, your actions, and your generous donations have helped to inform the government of Canada on our concerns domestically and internationally. They have promoted Ukrainian language, culture and sports, and have made 2011 an unprecedented year for UCC. But as you know, these battles must be fought continuously and be won again and again. Together, we must remain committed to a strong and vibrant Ukrainian Canadian community. We believe, at the end of this year, we will be able to say that we celebrated a successful 120th anniversary of Ukrainian Settlement in Canada through our immense achievements. With only a few days remaining in 2011, we would like to request your support to continue for the pivotal year ahead? If you’re able, we are asking you to please make a year-end contribution to continue our successful efforts in 2012. With your generous gift, UCC will hit the ground running in 2012. 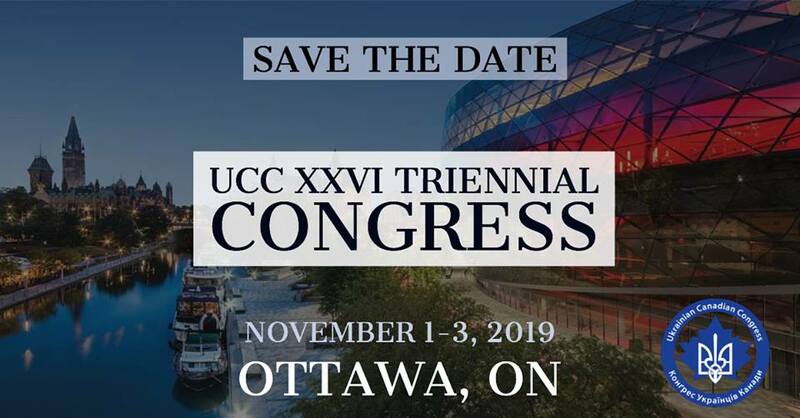 Please visit our secure donation form on our website to donate and to ensure you receive your 2011 tax receipt: https://ucc.ca/donate/donate-now/. You may also send a cheque payable to Ukrainian Canadian Congress Charitable and Educational Trust dated before December 31, 2011 and mail your cheque to us at Ukrainian Canadian Congress, 952 Main Street – Suite 203, Winnipeg, Manitoba, R2W 3P4. On behalf of the UCC board of directors, executive, volunteers and staff, I would like to thank you for your generous support. З наближенням кінця 2011 року нам хотілося б пригадати Вам про особливу віху, котру ми відзначили у цьому році: 120-ліття поселення українців у Канаді, та поділитися з Вами деякими досягненнями Конґресу Українців Канади. Завдяки Вам ми досягли реальних успіхів на користь українсько-канадської громади. Наші недавні зусилля були спрямовані на гарантію того, що Канадський Музей Людських Прав справедливо та рівноправно висвітлює Голодомор 1932-33 рр., а також Перші канадські операції по інтернуванню у новому канадському музеї, котрий споруджується на кошти платників податків. З початком 2011 р. Конґрес заініціював відзначення 120-ліття поселення українців у Канаді і випустив нове лого для відзначення цього історичного року. Лого було спроектоване митцем Олегом Лесюком. 24 жовтня 2011 р. – Конґрес влаштував перший щорічний “Український день на пагорбі”. Українсько-канадська громада провела свій інагуральний “Український день на пагорбі” з величним святкуванням української культури і насліддя в Конференційному центрі уряду з участю більше 400 гостей. 21-27 листопада 2011 р. – Конґрес провів свій щорічний Всеканадський тиждень визнання Голодомору. У містах по цілій Канаді були відслужені Служби Божі для вшанування 78-ої річниці Голодомору. Це лише декілька успіхів із довгого списку досягнень, звершених нами у 2011 р. Ми хочемо подякувати усім Вам за Вашу постійну підтримку, без якої нікотра з цих віх не була б осягнена. Ваша підтримка, Ваші дії і Ваші щирі пожертви допомогли поінформувати канадський уряд як про наші внутрішні турботи, так і про турботи на міжнародному рівні. Ці досягнення сприяли пропаганді української мови, культури та спорту і зробили 2011 рік – безпрецедентним роком для Конґресу Українців Канади. Але, як Ви знаєте, основою успіху є постійна і наполеглива праця, яку ми повинні не припиняти, щоб досягати нових перемог. Разом ми повинні залишатись відданими сильній та вібруючій українсько-канадській громаді. Віримо, що в кінці цього року ми матимемо можливість сказати, що завдяки нашим безмірним досягненням ми відсвяткували успішне 120-ліття поселення українців у Канаді. До кінця 2011 року залишається лише декілька днів і нам хотілося б попросити Вас продовжувати Вашу підтримку у наступному кардинальному році. Якщо маєте змогу, будь ласка, зробіть річну пожертву для продовження наших успішних зусиль у наступному році. З Вашим щедрим подарунком Конґрес Українців Канади у 2012 році працюватиме ще ефективніше. Пожертву на Конґрес Українців Канади можна скласти, виповнивши форму на інтернет-сторінці Конґресу за адресою: https://ucc.ca/donate/donate-now/ і отримавши при цьому посвідку на звільнення від податку. Ви також можете надіслати чек, виписаний на: Ukrainian Canadian Congress Charitable and Educational Trust з датою до 31 грудня 2011 р. Чек висилати за адресою: Ukrainian Canadian Congress, 952 Main Street, Suite 203, Winnipeg, Manitoba, R2W 3P4. Від імені Дирекції Конґресу, Екзекутиви, волонтерів і працівників я хотів би подякувати Вам за Вашу щедру підтримку.